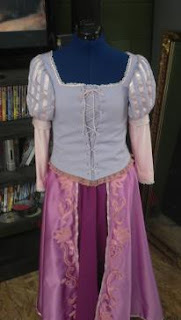 Also made recently for a client is the pink/purple gown from 'Tangled'. Unfortunately I did not get very many good pictures of this gown. It is two pieces, the front lacing bodice, and then a skirt with both elastic and drawstring in the waist. The main part of the bodice is crepe back satin, and lined in cotton broadcloth. It laces shut with lucet cord through hand-bound eyelets over a placket. The upper sleeves are made of the same crepe back satin with satin ribbons sewn down at even intervals, since we could not find an appropriate fabric. The lower sleeves are made of lycra, upon which I hand EMBROIDERED with success! I'm very sad this picture didn't turn out as the embroidery turned out really well, but it gives a vague idea. I made the skirt appliqués by first making the shapes out of pink satin and appliquéing them to pink felt with machine zigzag stitch and then cutting them out again and hand sewing them to the skirt by hand. I did not make enough to go around the entirety of the skirt edge as time and money was limited. The underskirt is attached as a lining, and edged with eyelet. Again, sadly no picture, but it is seen often in the movie, like when Rapunzel first comes out of her tower. The skirt itself it made from gores and both layers are very full and swishy. Again, this was a very fun project, translating an animated concept into real life. Fabric and lace selection took forever, as there are so many different little pieces to co-ordinate, and three types of lace (the eyelet on the underskirt, the pink lace on the bottom edge of the bodice, and the narrow white lace at the cuffs and neckline). I am very elated with the finished gown.